Knowing some basic warning signs of common vehicle issues is a great way for car owners to extend the lifetime of their car because they get their car to a professional much quicker. 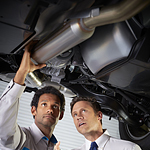 That is why our team of experts here at Philpott Pre-Owned Super Center is so excited to tell you all about some signs that your muffler and exhaust system may need servicing. First, if you consistently notice that your car is backfiring, then this may be indicative of some internal problems in the exhaust system. Next, look for pools of liquid that are accumulating beneath the tail pipe of your vehicle once you have been parked for awhile. This can mean that fluids are leaking in your car which should be investigated by a qualified professional as quickly as possible. Finally, if you notice excess rust on your muffler, it may be time to replace it so that it can continue to function as it was designed.